When deciding on a new marketing strategy, a few key issues need to be resolved in order maximize the return on investment of the marketing dollars to be spent. Understand your company, the competitors and the industry. Analyze the industry regarding how your competitors, suppliers, and buyers interact and react to each other. Look into how easy or hard it is for new entrants or for substitute products to enter the market. Do a SWOT analysis (SWOT = Strengths, Weaknesses, Opportunities, Threats) for your own company. Explore possible ways of going up against the competition. Decide whether to directly or indirectly attack their products. If directly attacking the competitor, understand the defenders strengths and determine whether you can beat them on the product, the price or the advertising. If attacking indirectly, decide what competitor weakness to compete against (i.e. geographical, price, size gaps or others). Perhaps you plan to go completely around the competition and create a new market entirely? Determine and understand the sources of risk. Risk can come from many sources, especially depending on where on the technology and market spectrums a new product falls. Products that are simply an evolutionary innovation within an existing market using exiting technology will have a low level of risk. By contrast, products that require new technology and are creating a new market will have higher risk. Establishing what these sources of risk are will help the team decide how to address them as they come up. 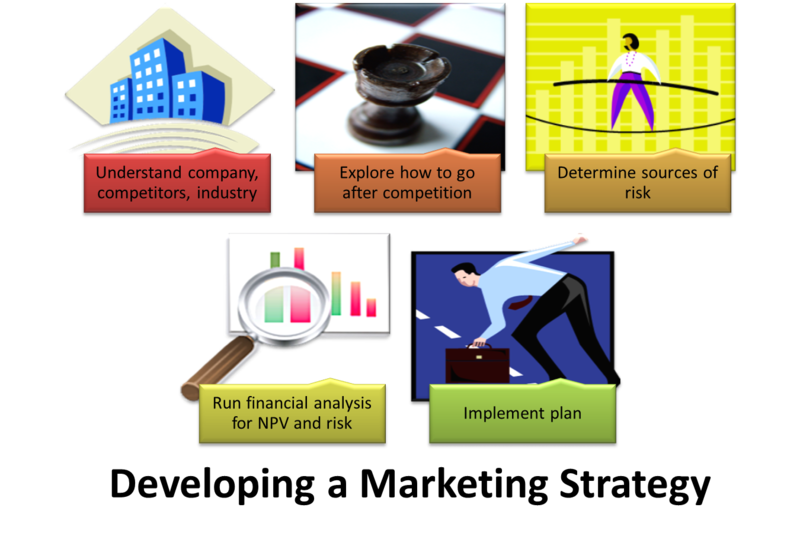 Do a financial analysis to determine risks and benefits for strategic choices. Create financial models to determine cash flows and NPVs for each scenario depending on the risk and solutions discussed. Use a simplified spread sheet model or a more complex pro forma style. Various types of charts can visually assist teams in seeing the data, such as tornado charts or fish bone diagrams. By visualizing risk versus return developed from the excel modeling, data driven decision-making can be used to decide on a plan. Develop and implement the plan. Look inside the firm to determine if you have the resources, the time, the human capital, and whether the direction is consistent with company values, mission and goals. Develop the profile of the product, determine pricing, decide where and how the product will be sold or displayed, and develop the relevant promotions. Having a well thought-out marketing strategy can help you and your team ensure a successful campaign. 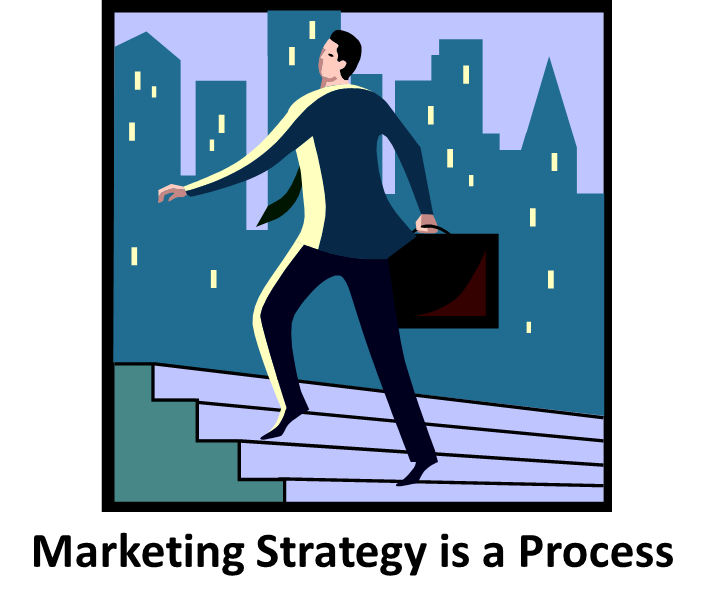 These steps offer a guide on the process of developing a marketing strategy. For assistance in developing a marketing strategy or business plan, contact us at PN&S Consulting, a marketing strategy and business plan consulting practice. You can connect with me on LinkedIn, Google+, Twitter (@SaraPaisner), via email, or on Facebook. This entry was posted in Business Strategy, Marketing, Marketing Strategy, Traditional marketing and tagged Business strategy, competitive analysis, digital marketing, marketing, marketing ROI, Marketing strategy. Bookmark the permalink.